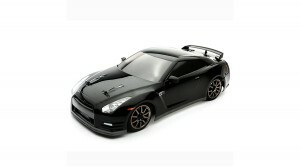 The newest offering from Vaterra is the 1/10 2012 Nissan GT-R. It is a shaft driven 4wd sedan with sealed differentials, waterproof electronics and Lipo ready speed control. Everything need to take this GT-R out for a spin is included in one box. Some of the components included are a Spektrum DX2E 2.4 radio system, Dynamite 7.2volt 1800mah battery and Dynamite 2A AC peak charger. For more info check out the Vaterra website.